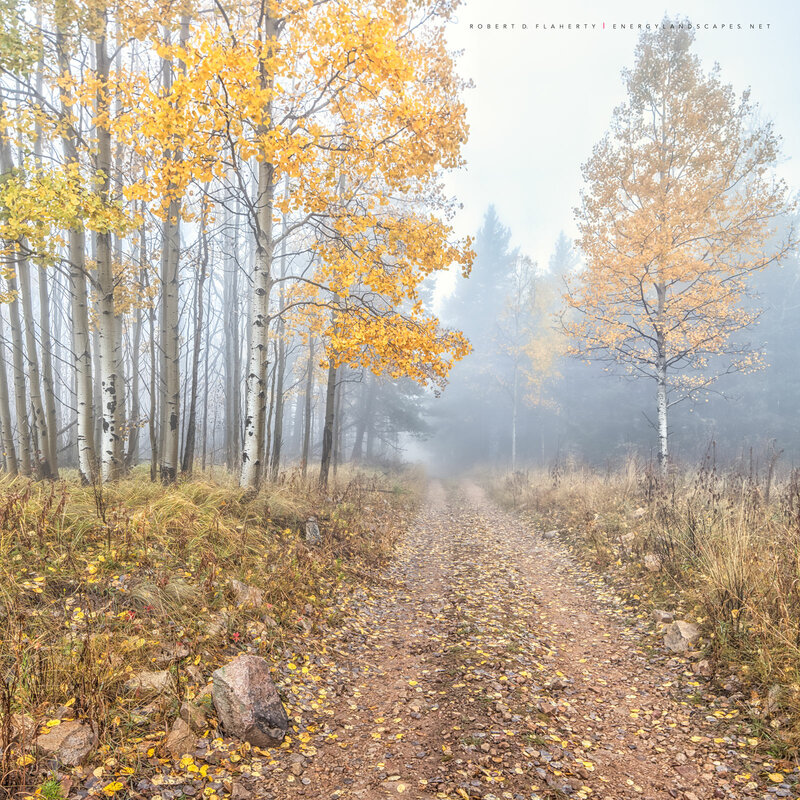 In this gallery you will find high resolution fine art landscape photography from my latest work in the South Central Mountains of New Mexico. Ruidoso is home to my new studio gallery Topside Gallery. When in Ruidoso please make plans to come by my studio gallery high above Midtown Ruidoso. 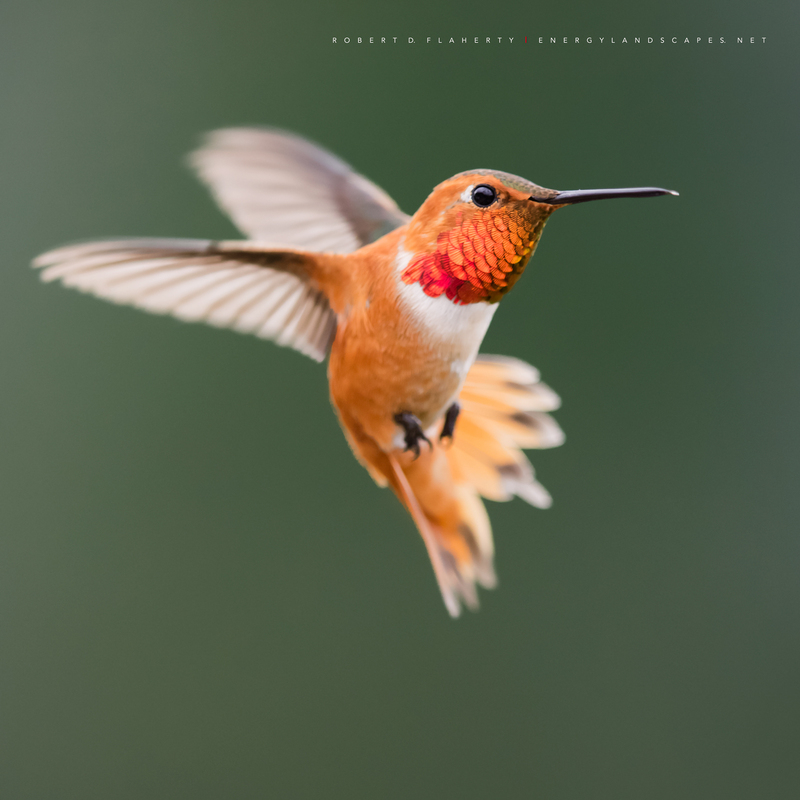 In addition to fine art landscape photography from Ruidoso and the surrounding area the studio houses the worlds largest collection of fine art oil & gas photography from locations throughout the United States. The gallery is appointment only so please contact Shanna Flaherty at 432-208-5412 to set up a time to come by. Over 150 large format high resolution panoramic prints are available for viewing so we usually like to reset the gallery to reflect prints you would like to see. You can also choose to stay in one of our six upcale short term vacation rental properties. Each location has an in home art gallery complete with gallery lighting. The galleries feature fine art landscapes from the Ruidoso area but can be reset to reflect choices you may want to see in my fine art oil & gas photography. The homes provide a rare opportunity to see my work properly lit under gallery conditions and are a great for people looking for ideas in regard to updating a home or office. Carrizo Valley Monsoon is a 3:1 panorama photographed during the 2018 Summer Monsoon season. The image was shot from a ridge line above the city of Nogal Northwest of Ruidoso New Mexico. 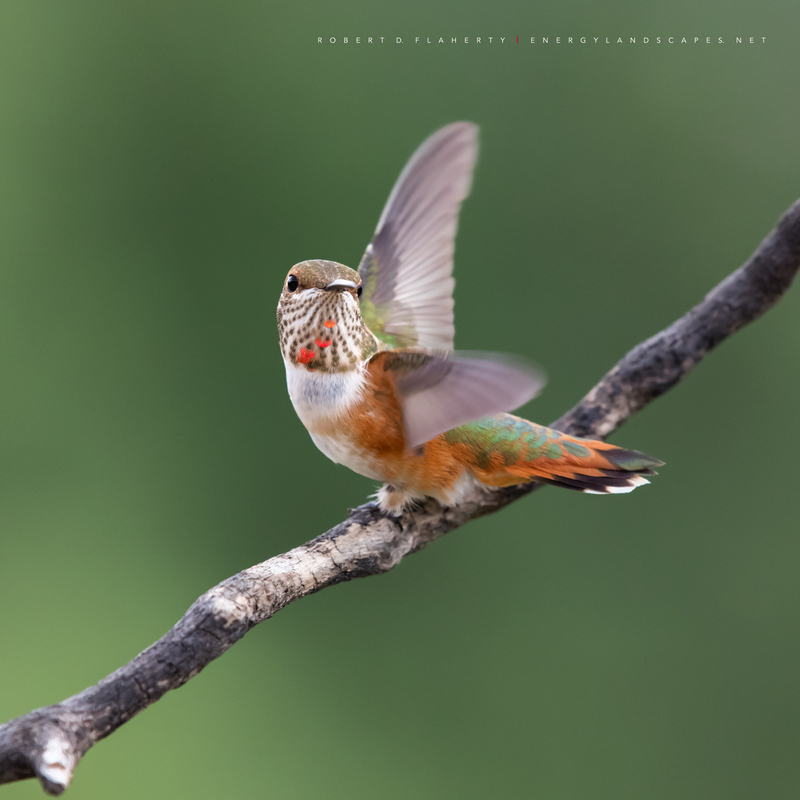 The image consists of 98 high resolution images blended down to a 3:1 ratio panorama. The image could be printed as a fine art mural up to 20x60 feet. 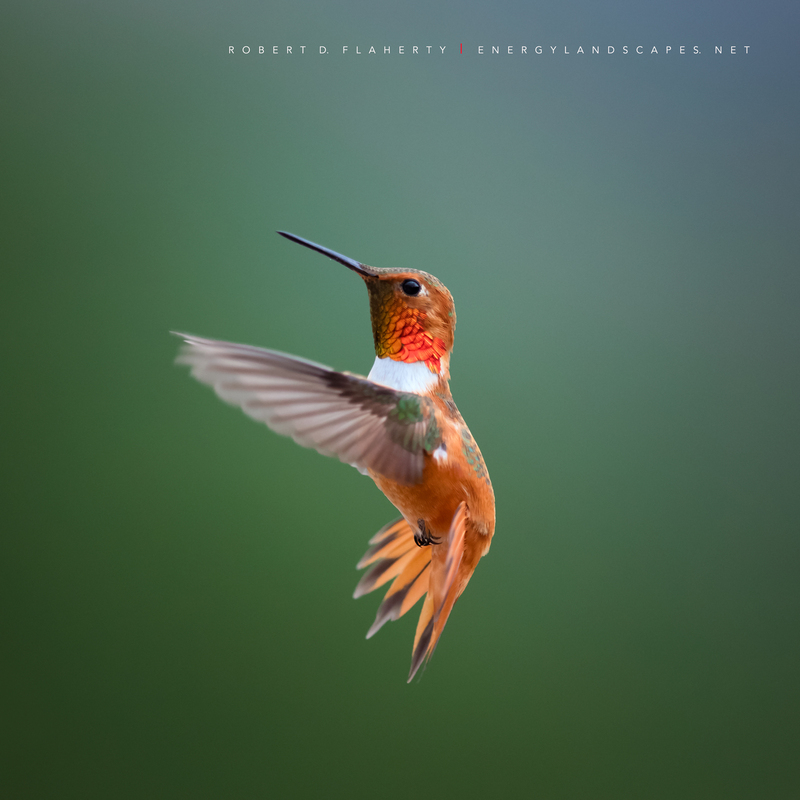 Fine art Prints on fine art paper or canvas range from 30" long to 96". The image contains a double lightning strike at the foot of Carrizo Peak. New Mexico Fine Art landscape photography by Robert D. Flaherty. Photo © copyright by Robert D. Flaherty. 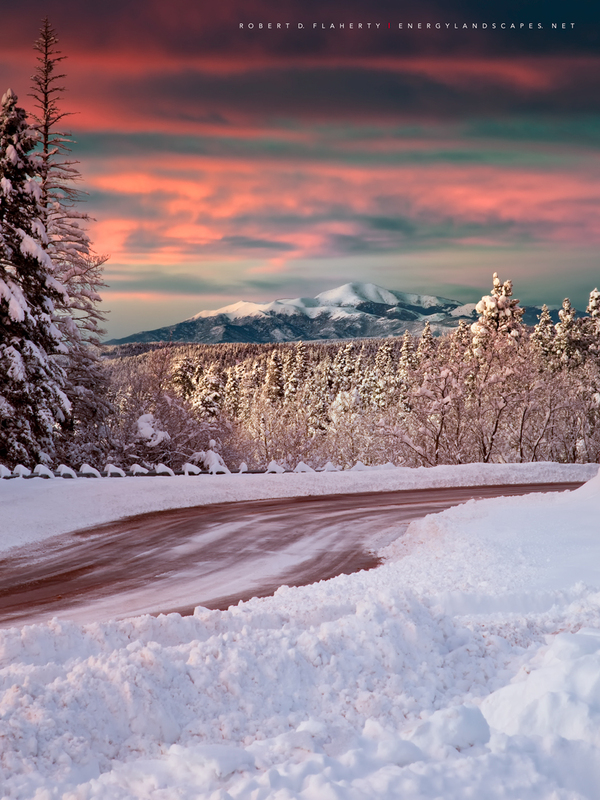 The Magic Of Winter was photographed a short distance from my home above Ruidoso New Mexico. The image was taken the morning after a 30 inch snowstorm several days after Christmas 2018. The image is actually a composite of 98 high resolution images blended into a 3:1 panorama. The process allows for extraordinarily detailed fine art prints up to 40x120". 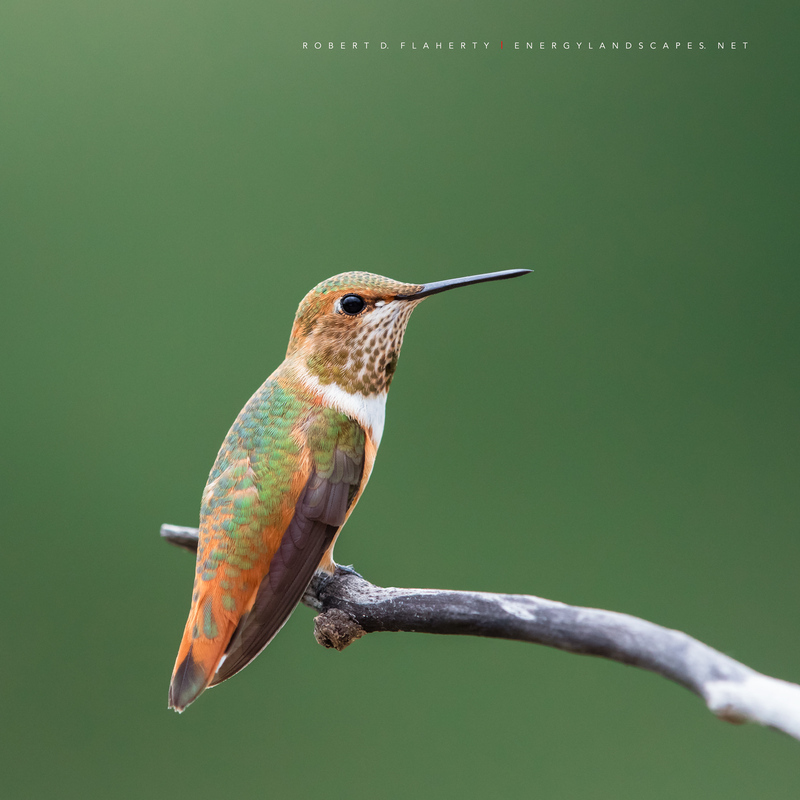 Prints on fine art canvas are available up to 32x96". The waist deep snow at this location required snowshoes to get in and out. A 110 inch tripod and step ladder were used to photograph the scene from a higher perspective thus contributing to sense of depth the image is known for. 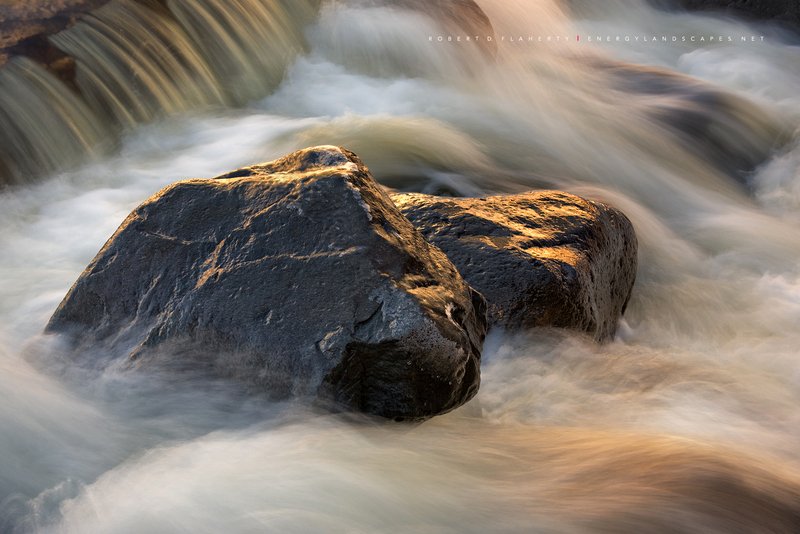 Softly Spoken was photographed on the Bonito River near Ruidoso New Mexico. The image is an abstract featuring a beam of warm light projected into a dark portion of the river just after sunrise in early April. 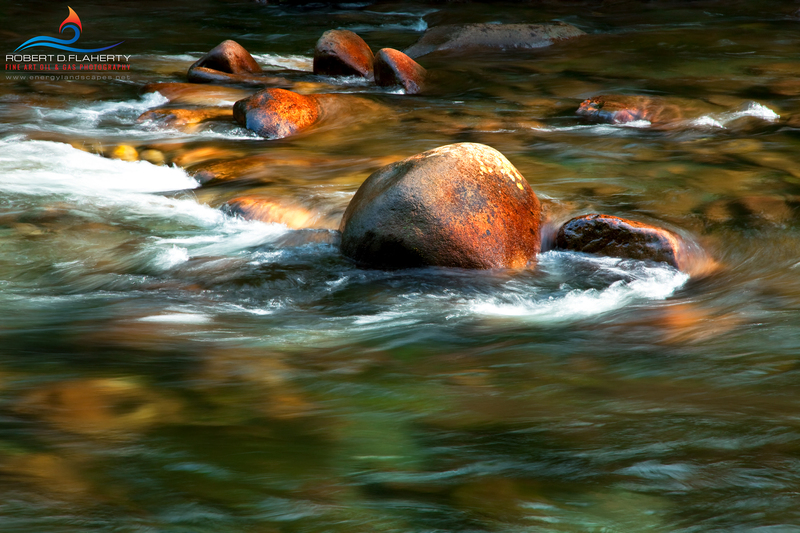 The river flowing through the image creates a nice three dimensional feel. The photograph is optimized for 4000K lighting and is available in sizes up to 40x60". The image is a high resolution panorama with an approximate 4:1 ratio featuring the shopping district of Midtown Ruidoso New Mexico. The image was taken three days after Christmas at 4:00 a.m. well before sunrise. The moon was full Christmas day and two days later the moon is at my back balancing the light from the city with the illumination of Sierra Blanca towering above Ruidoso. The image is a composite of 63 high resolution images into one panorama containing 4.24 billion pixels. Sizes range from 32" to 96" wide. When in Ruidoso come by my new studio gallery Topside Gallery to see the image in large format under gallery lighting conditions. Sierra Blanca Spring Panorama was originally photographed as a high resolution fine art mural. The image is composed of 96 separate photographs rendering 7 levels of light. Canvas gallery wraps are available up to 96" wide. The 180 degree view includes Sierra Blanca, The Tularosa Valley and White Sands National Monument. The panorama was taken in early June 2015 from an altitude of 11,600 feet. Make an appointment to stop by Topside Gallery to see the 96" version under gallery lighting. This is an exceptionally detailed image of Sierra Blanca. 6.24 billion pixels allow every rock and tree to be viewed individually. New Mexico fine art landscape photography by Robert D. Flaherty. Three Rivers Spring Panorama In Sepia was photographed in early June 2016. 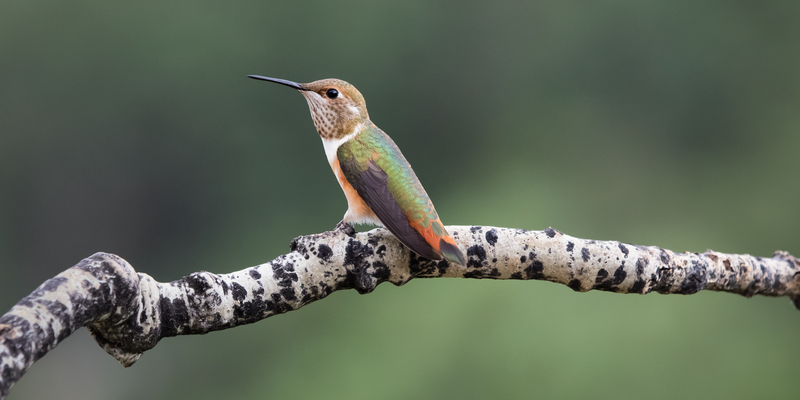 The image was taken at an elevation of 11,600 feet on a mountain peak just North of Sierra Blanca. The panoramic image is centered above the Three Rivers Wilderness on the West side of Sierra Blanca. This is a high resolution 4:1 composite panorama made from 112 medium format images. The panorama is composed of 6.24 billion pixels. 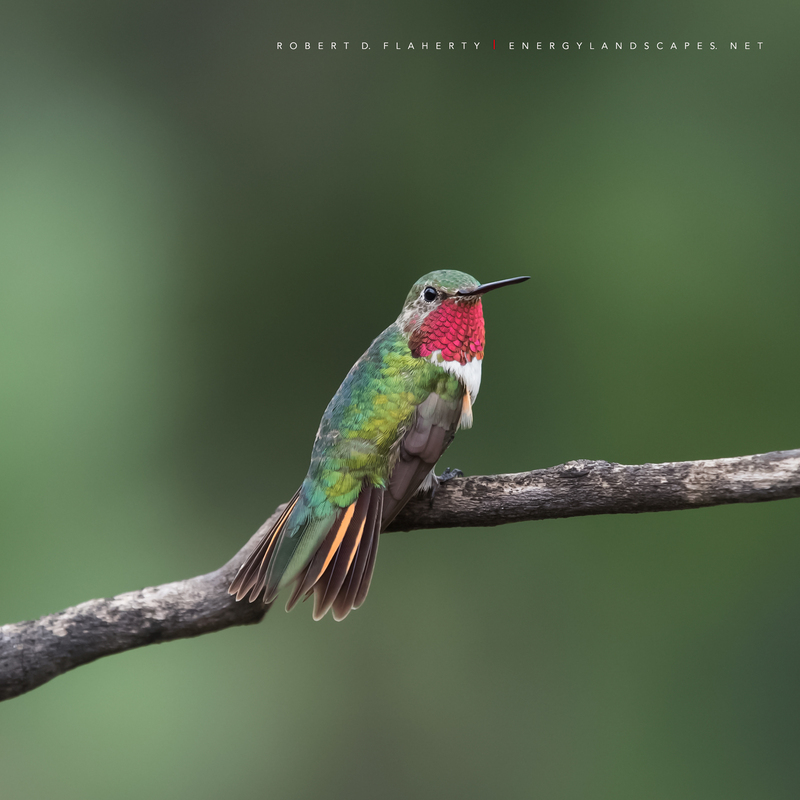 Fine art prints are available from 36 to 96" in length. The image features a developing line of thundershowers crossing the Tularosa Basin. At an altitude of 11,600 feet, the late afternoon sunlight can be seen shining through the rain shafts and virga not yet reaching the ground. In early June the moisture from the Summer Monsoon has not yet reached the West side of the Central Mountains. Daytime heating this time of year is enough to generate the showers but most of the the precipitation evaporates before reaching the ground. See the 96" version of this 4:1 panorama at my studio gallery at Topside Gallery overlooking Ruidoso New Mexico. Fine art landscape photography by Robert D. Flaherty . Photo © copyright by Robert D. Flaherty. Windmill At Border Hill was photographed in Lincoln County New Mexico during the 2015 monsoon season. The windmill is a frequent sight for people traveling between Roswell and Ruidoso. The Capitan Mountains can be seen flanking the windmill at sunset. Photographed in medium format, extraordinary detail can be seen particularly in the forground. 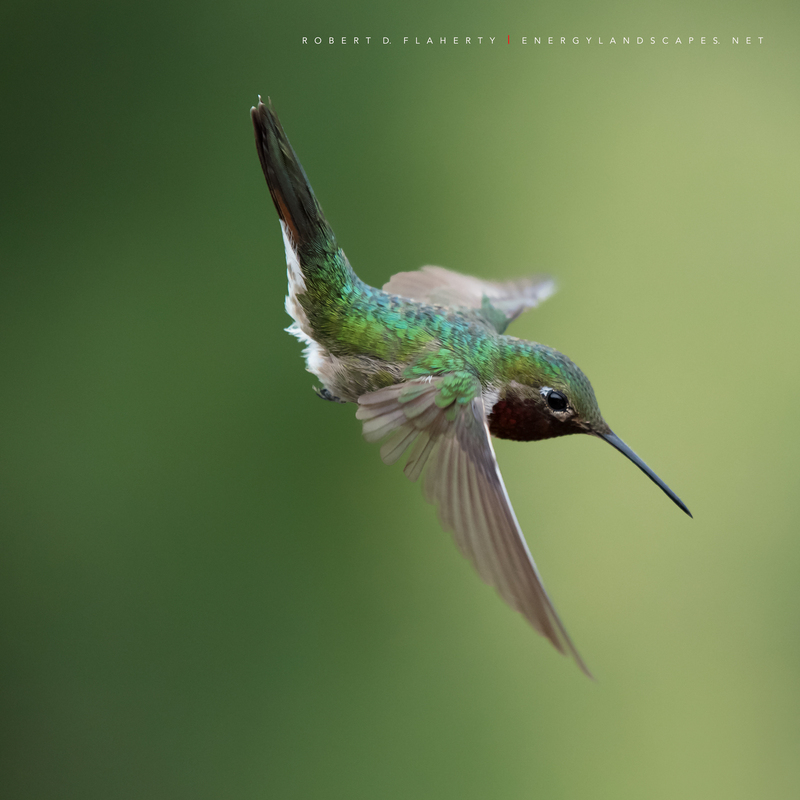 New Mexico fine art photography by Robert D. Flaherty. Photo © copyright by Robert D. Flaherty. 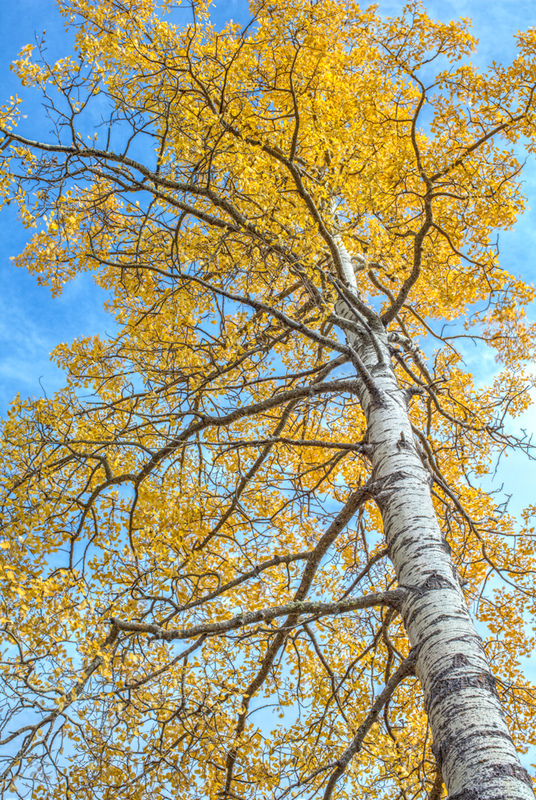 Capitan Aspen Vertical was photographed on top of the Capitan Mountains in October 2015. When In Ruidoso, contact myself or Shanna to set a time to come by Topside Gallery to see the image at 60" tall under gallery lighting. 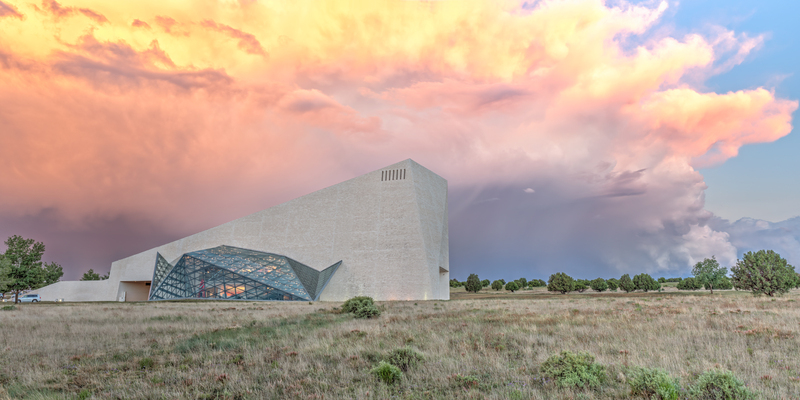 Topside is currently the only New Mexico gallery featuring Sorra Led lighting. Dr. Shuji Nakamura, the inventor of the Sorra Blue Led was awarded the Nobel Prize in Physics in 2014 for the new technology. New Mexico fine art landscape photography by Robert D. Flaherty. Leisurely Walks was photographed on top of the foggy Capitan Mountains in early October 2015. Fine Art Landscape Photography By Robert D. Flaherty. Photo © copyright by Robert D. Flaherty. Capitan Aspen Panorama was photographed on top of the Capitan Mountains in October 2015. The image was photographed originally to be a high resolution fine art wall mural. 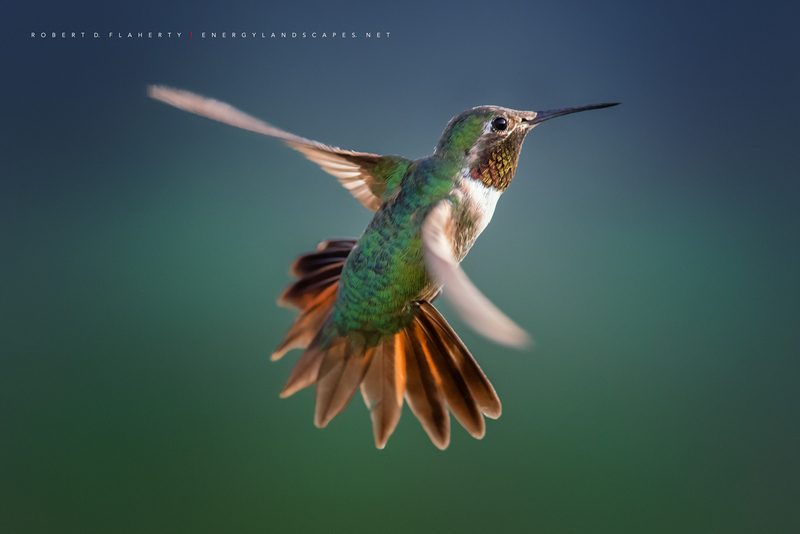 The image is actually a composite of 96 high resolution images using the world's highest quality 55mm lens. The result is a uniquely detailed three dimensional panorama that has to be seen to be appreciated. 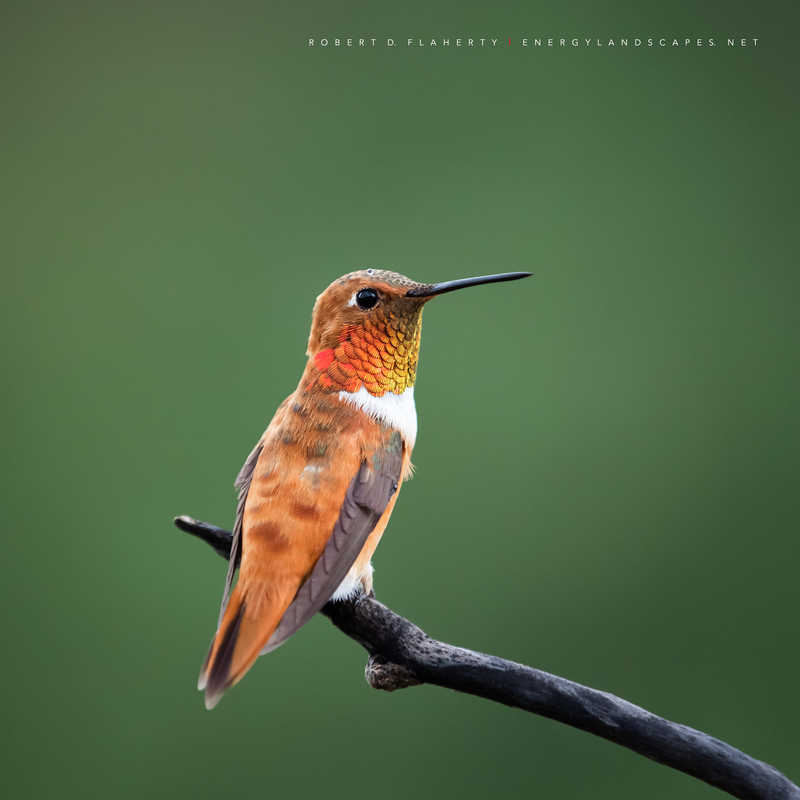 When In Ruidoso, contact myself or Shanna to set a time to come by Topside Gallery to see the image at 96" under gallery lighting. Topside is currently the only New Mexico gallery featuring Sorra Led lighting. Dr. Shuji Nakamura, the inventor of the Sorra Blue Led was awarded the Nobel Prize in Physics in 2014 for the new technology. New Mexico fine art landscape photography by Robert D. Flaherty. Photo © copyright by Robert D. Flaherty. Rise And Shine was photographed at my home overlooking Ruidoso New Mexico. An Early Autumn was photographed during a summer thunderstorm at my home overlooking Ruidoso New Mexico. Touch Of Orange was photographed at my home overlooking Ruidoso New Mexico. Brush Strokes Of Nature was photographed at my home overlooking Ruidoso New Mexico. Morning Glory was photographed at my home overlooking Ruidoso New Mexico. Center Of Attention was photographed at my home overlooking Ruidoso New Mexico. 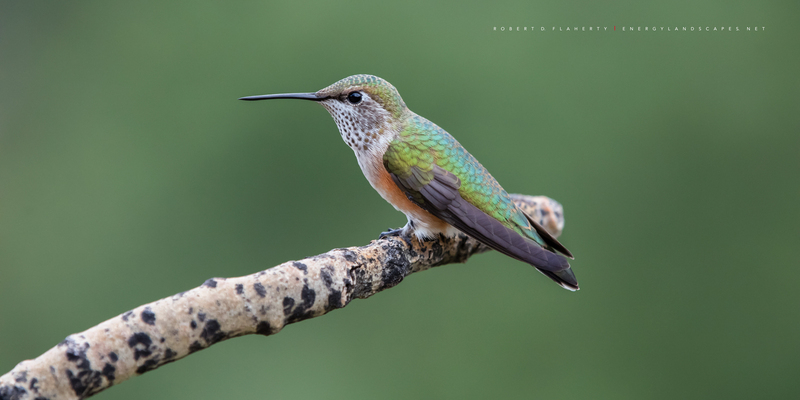 Aspen Perch was photographed at my home overlooking Ruidoso New Mexico. Visual Rhythm was photographed at my home overlooking Ruidoso New Mexico. 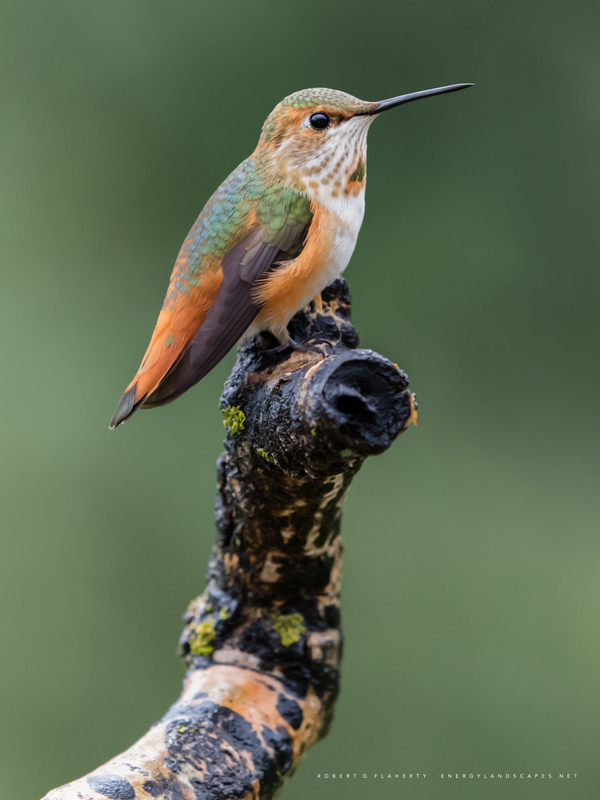 Rufous In Detail was photographed at my home overlooking Ruidoso New Mexico. Summers Last Fling was photographed at my home overlooking Ruidoso New Mexico. 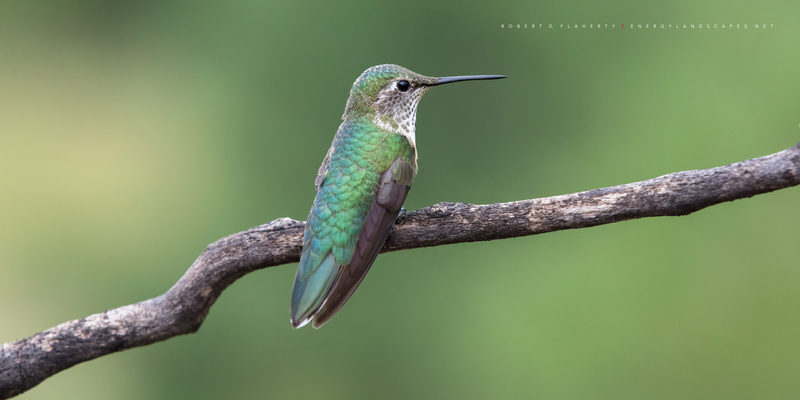 Complex Beauty was photographed at my home overlooking Ruidoso New Mexico. 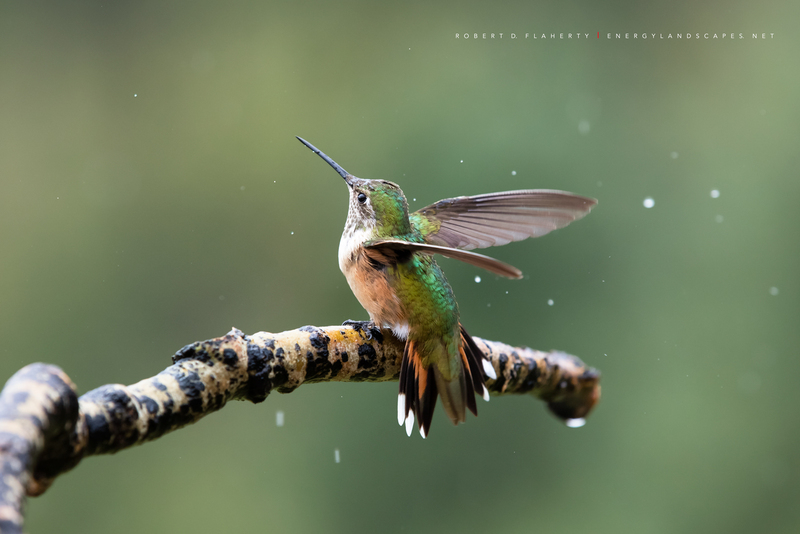 Arabesque was photographed at my home overlooking Ruidoso New Mexico. The image is a high resolution panorama with an approximate 4:1 ratio featuring the shopping district of Midtown Ruidoso New Mexico. The image was taken three days after Christmas at 4:00 a.m. well before sunrise. The moon was full Christmas day and two days later the moon is at my back balancing the light from the city with the illumination of Sierra Blanca towering above Ruidoso. The image is a composite of 63 high resolution images into one panorama containing 4.24 billion pixels. Sizes range from 32" to 96" wide. When in Ruidoso come by my new studio gallery Topside Gallery to see the image in large format under gallery lighting conditions. Photo © copyright by Robert D. Flaherty. 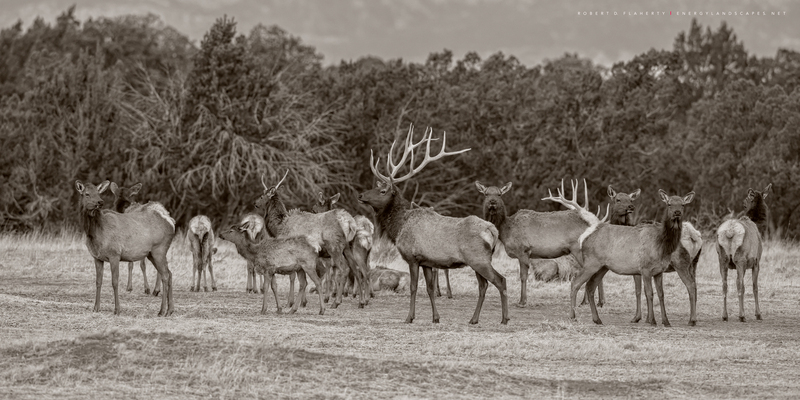 Capitan Elk Panorama In Sepia features a group of Elk enjoying an extraordinarily warm Sunday morning in early March 2017. For the second year in a row New Mexico has experienced the warmest March on record. The location is the Northern base of the Capitan Mountains on the Capitan Ranch 30 miles North of Ruidoso New Mexico. 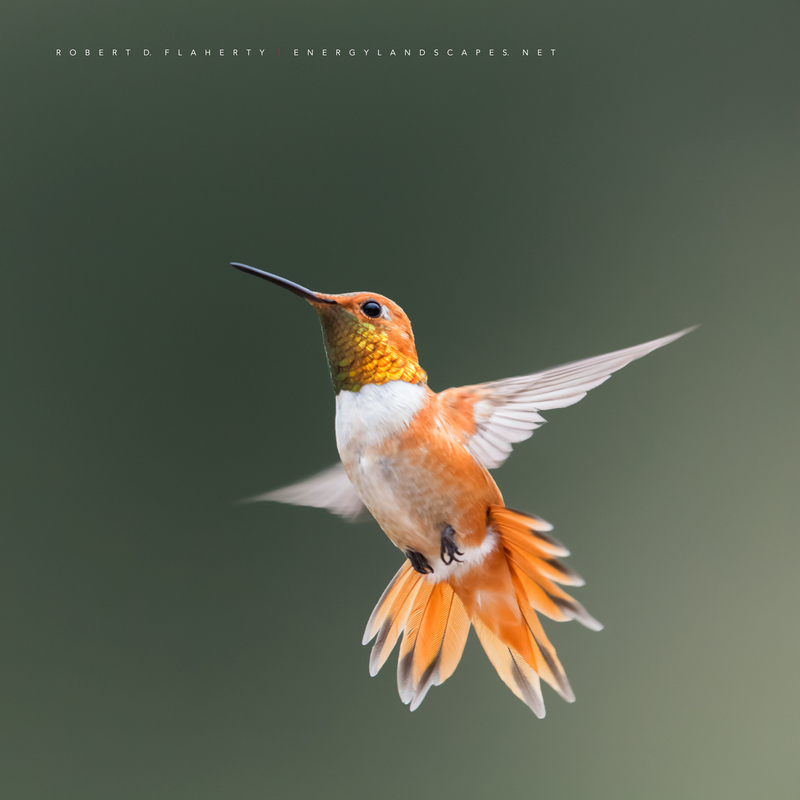 Fine art photography by Robert D. Flaherty Ruidoso New Mexico. Photo © copyright by Robert D. Flaherty. Opening Act was photographed in early June 2015 and features the Spencer Theater in Alto New Mexico. The image is a high resolution composite composed of 63 images representing 7 levels of light. A perspective control lens was used to render all points in perfect focus from near to far. 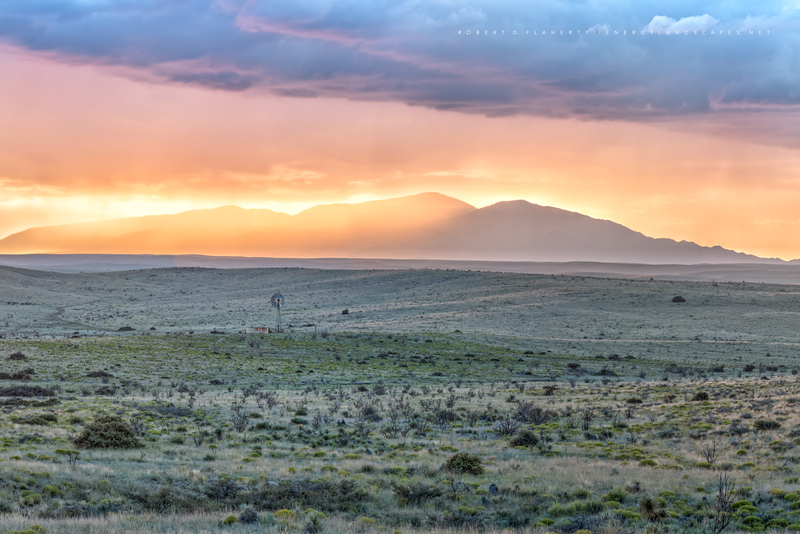 A 36x72" print is permanently on display in the Lobby of the Spencer Theater in Alto New Mexico. I also have several sizes of the print on display at Topside Gallery which is my studio gallery overlooking Ruidoso New Mexico. Photo © copyright by Robert D. Flaherty. 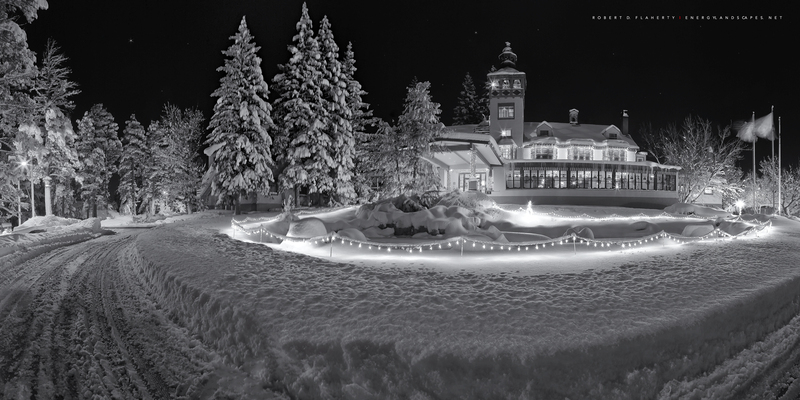 The Lodge At Cloudcroft In Winter is a medium resolution composite panoramic taken after a 30 inch snowstorm December 1st. 2009. Photo © copyright by Robert D. Flaherty. 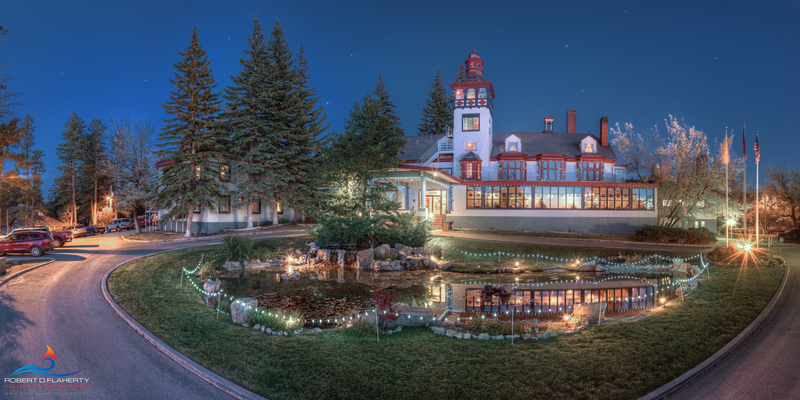 The Lodge At Cloudcroft In Fall was photographed in October 2014 as a high resolution composite panorama. 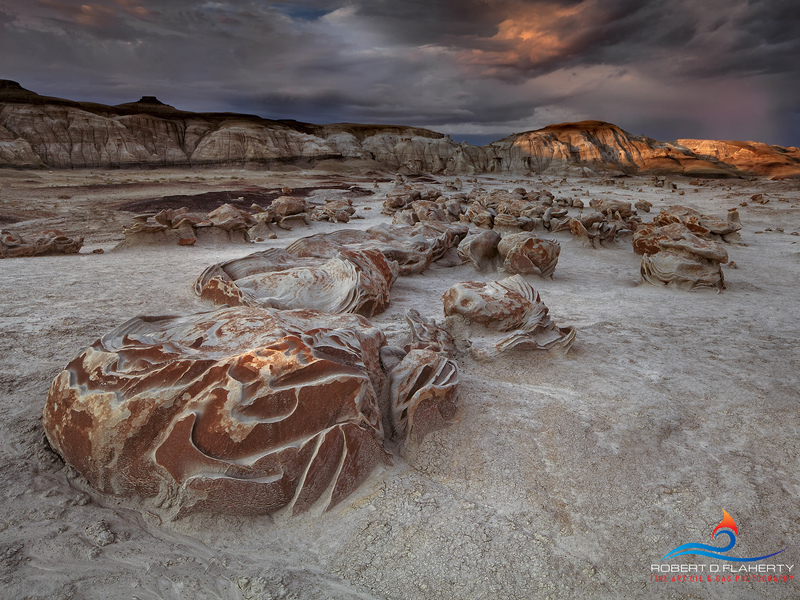 The Beauty Of Desolation is set in the Bisti Wilderness during the monsoon season in the Navajo Lands of Northwestern New Mexico. Bisti is the driest region in New Mexico. I spent twelve overnight trips here photographing the region only during the brief monsoons of 2011 and 2012. Look for new photography during 2017 from this area and Ship Rock. New Mexico fine art landscape photography by Robert D. Flaherty. Photo © copyright by Robert D. Flaherty. 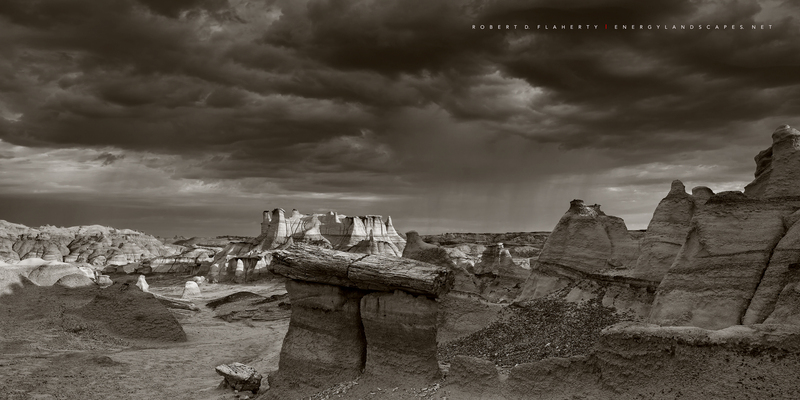 Time And Autonomy Meet was photographed at sunrise during the short 2012 monsoon season in the Bisti Wilderness of Northwestern New Mexico. Over 80 million years ago, The area was once covered by an inland sea. New Mexico fine art landscape photography by Robert D. Flaherty. Photo © copyright by Robert D. Flaherty.